Welcome back for the second edition of MODA’s premier makeover series! If you missed the first article, or just want a refresher on the rules, here’s the link to the first feature. This week, I helped out a Bryce, long time friend of mine who I’ve known for almost six years. 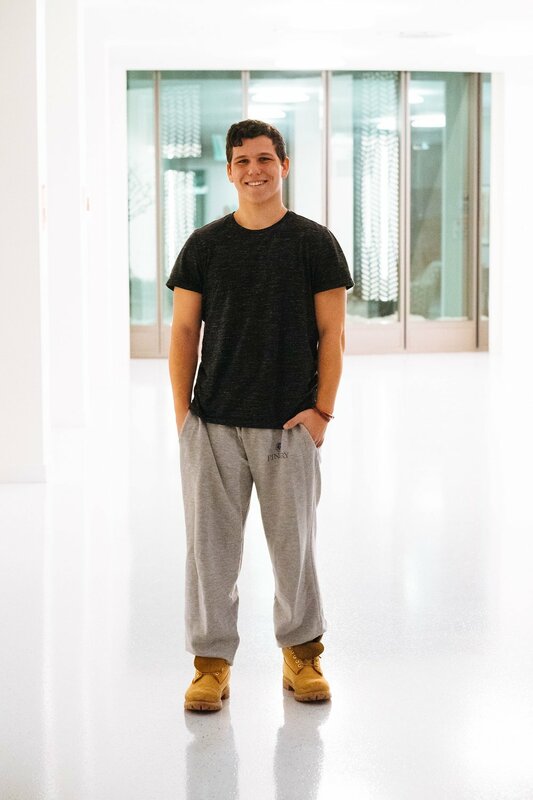 He is a third-year from New Jersey who is double majoring in Economics and Psychology. Sporty would be a good way to define his style, and he is a massive baseball fan. Also, in my humble opinion, he is incredibly genuine and kind. This is starting to sound a bit like a dating profile on him though, so lets get into his first two looks. With this outfit, I was trying to channel Bryce’s sporty style into a slightly cooler outfit for day-to-day use. 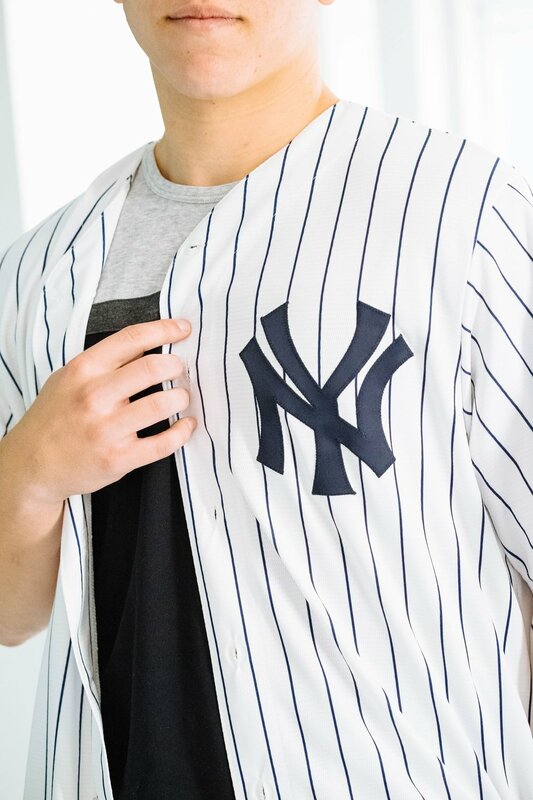 The NY Yankees button-down jersey is the core piece here, as it manages to both bring out Bryce’s sportiness, while also making a plain t-shirt and pants much more interesting. I’ve said it before and I will say it again: layering is essential!!! You can add so much depth to a look by adding more elements. The combination of the large, horizontal stripes on his t-shirt and thin, vertical stripes on the jersey are an interesting pattern clash that also isn’t too abrasive. I think this outfit does a great job of letting Bryce’s personality shine through, while not being too far from what he is comfortable in. With that, let’s move onto the second look. This second look shows how combining a few simple basics can become more than the sum of their parts. A pair of light-wash jeans, a raglan t-shirt and a brown bomber jacket are all nice on their own, but together they can form a comfortable and cool outfit. Blue, gray and brown all look great with each-other, and cuffing the pants adds a bit of intention to this casual look. You could wear this virtually anywhere while looking and feeling great. It really is this simple to dress yourself in ways that make you feel and look good. It was an absolute pleasure working with Bryce and going through his closet… which had six plain white Banana Republic shirts, four of which are unopened though, so he can spare a couple if you’re in need! He’s also cute and single, and now that he knows how to dress a bit better, would be a great catch for any of our female readers. I promise this isn’t the reason we did this. Per usual, if you know anybody who would be a good fit for their own Peer Eye feature, email me at jwiltzer@uchicago.edu. See you next time! All pictures courtesy of Angela Fung.